Saint Patrick's Day celebrates Irish culture and remembers St. Patrick, a patron saint of Ireland. He brought lessons of Christianity to Ireland and the Celtic cross symbol, by combining a sun, a powerful Irish symbol, with a Christian cross. Other things over the years have been tied to St. Patrick's Day, such as shamrocks, leprechauns, and wearing green. It is said if you wear green, you will be invisible to leprechauns and will avoid their pinches! This holiday offers many opportunities for conversation and activities for the person with dementia. Irish soda bread gets its name and uniqueness from the use of baking soda rather than yeast as a leavening agent. More than 100 St. Patrick’s Day parades are held across the United States. New York City and Boston have the largest celebrations. In 2009, about 26.1 billion pounds of corned beef and 2.3 billion pounds of cabbage were produced in the United States! Try some Irish food, like Shepherd’s Pie, Corned Beef and Cabbage, and Irish Soda Bread. Enjoy a rainbow snack: Line up colored Froot Loop cereal to create a rainbow. Then eat! Create a sample first, that the person can follow. Do a shamrock craft: Dip a large marshmallow into green paint and stamp it 3 times, to make a 3 leaf clover. Use a paintbrush to add the stem of the clover. And, of course, an easy thing all an do is wear the color green! 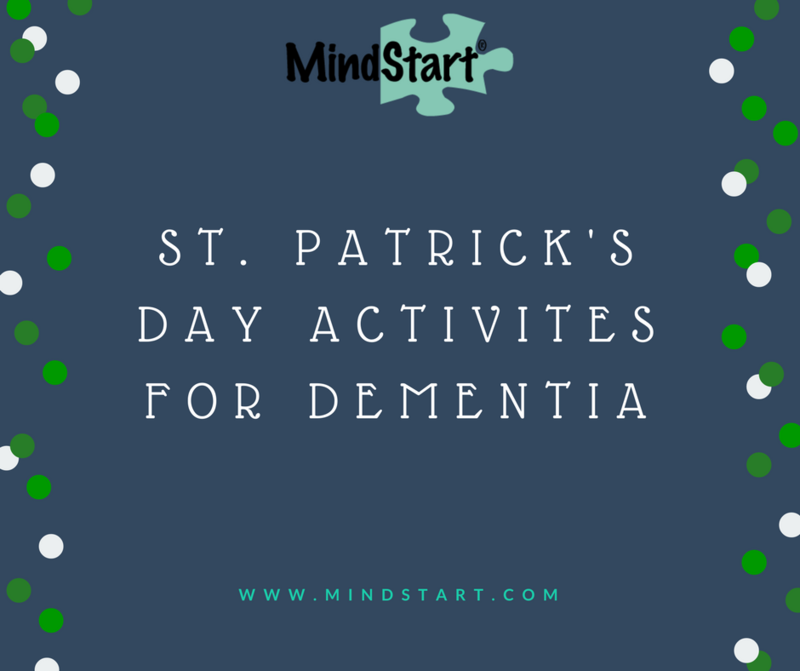 Hope that gives some ideas for activities for St. Patrick's Day, to do with the person with dementia. Need more activity ideas or not sure how to adapt activities for those with dementia? Sign up to receive our e-news, filled with activity ideas and dementia care tips.